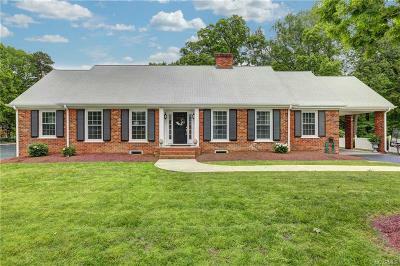 Do not miss this incredible and rare opportunity for loads of space all in the heart of Colonial Heights! This gorgeous brick cape cod also boasts an in-law suite in the fully finished basement! The beautifully landscaped lot is spacious and well appointed. When you enter this home, the layout seems traditional with formal living and dining rooms all with pristine hardwood floors and crown molding but as you get into the kitchen/family room, you notice the incredible updates! The kitchen is a true chefs dream with granite countertops, custom cabinets, Kitchen Aide appliances including dual-fuel gas cook-top and electric oven, glass tile backsplash, and island. The family room overlooks the large composite deck with great views of backyard. The addition off of the kitchen is great for sunroom/eat-in kitchen and large laundry room with lots of storage next to the back door. The first floor also has master suite with gorgeous updated bath and custom walk-in closet, two additional bedrooms, and updated hall bathroom. The second floor has 2 bedrooms, full bath and loads of walk-in attic storage. Come check it out and be in just in time to walk to the neighborhood pool this summer!! Directions: From 95 - Take Temple Road Exit 54 To 144 South - Left Onto Conduit Road - Right On Duke Of Gloucester - House Is On The Right At The End Of The Street.